The city of love and lights looked like a war zone Monday, with tens of thousands of troops positioned throughout Paris as France remained on high terror alert after last week's series of deadly attacks. Defense Minister Jean-Yves Le Drian said 10,000 troops and 5,000 extra police officers would be in place by Tuesday night in sensitive areas, including at hundreds of Jewish schools. The unprecedented troop deployment came days after a massacre by Muslim extremists at the office of satirical magazine Charlie Hebdo and shootings by their alleged accomplices in a kosher supermarket in a Jewish section of Paris. 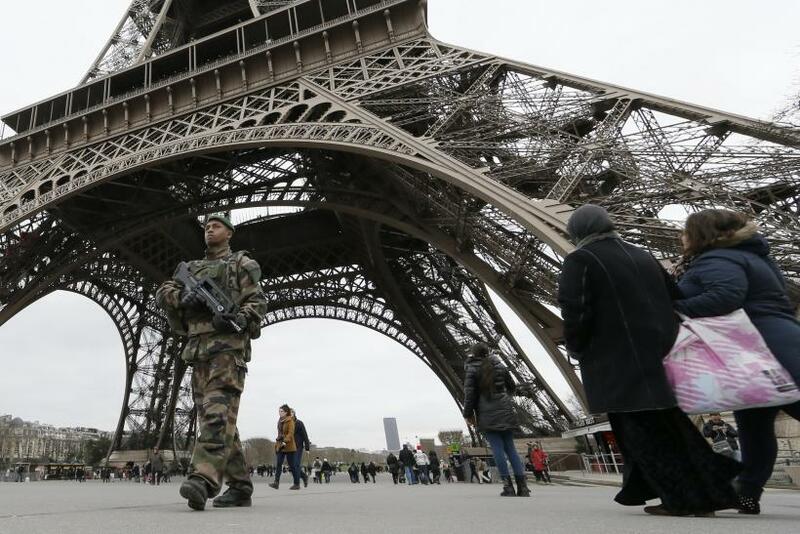 French President François Hollande called for the soldiers to protect tourism sites and transportation centers during a crisis meeting with top officials early Monday, according to the BBC. 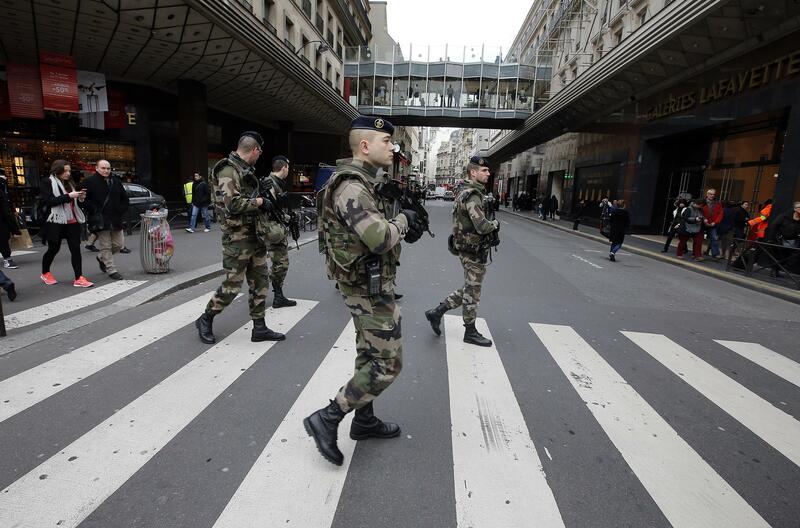 Troops were also being sent to more than 700 Jewish schools and to synagogues and mosques throughout Paris. France is home to Europe's largest Muslim and Jewish populations. 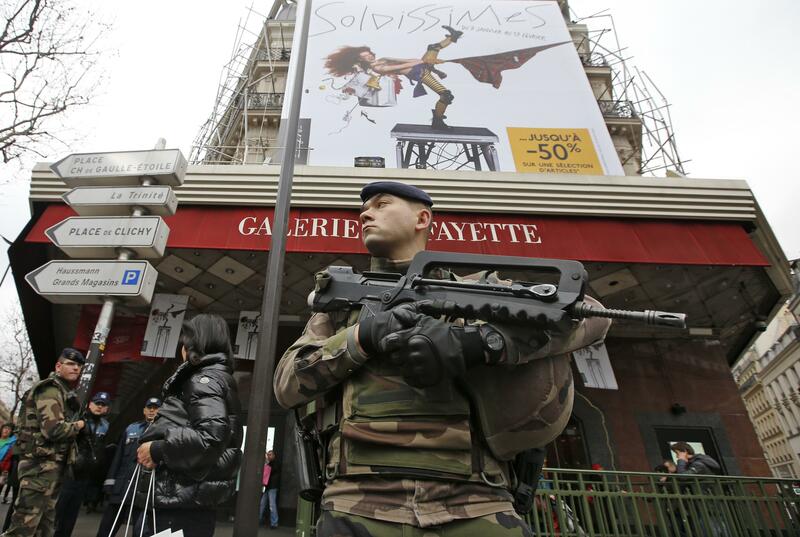 Defense Minister Jean-Yves Le Drian said Monday that the country remained a target. "The threats remain and we have to protect ourselves from them. It is an internal operation that will mobilize almost as many men as we have in our overseas operations," Le Drian told reporters after a cabinet meeting, according to Reuters. "Synagogues, Jewish schools -- but also mosques -- will be protected because in the past few days there have been a number of attacks against mosques." The attacks started last Wednesday when two brothers with ties to Islamist militants stormed Charlie Hebdo's newsroom and killed 12 people, including two police officers. 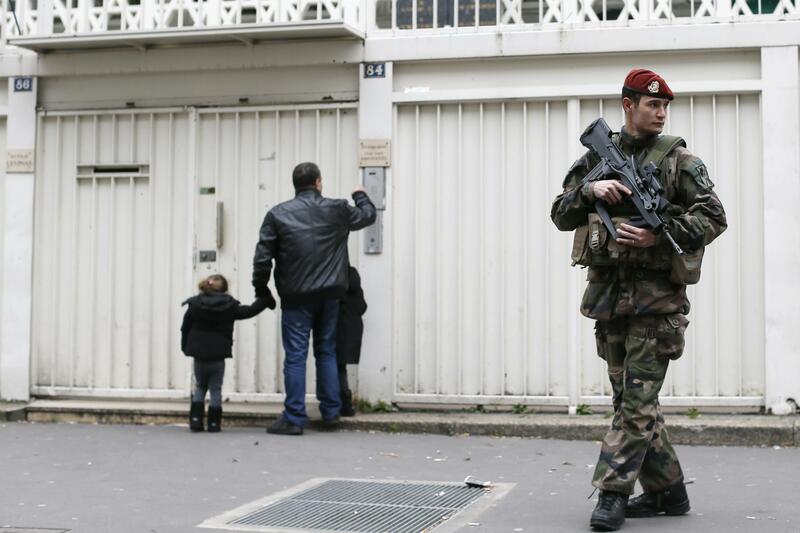 Two days later, an accomplice killed four people at a kosher supermarket in Paris. Charlie Hebdo was allegedly targeted for publishing cartoons satirizing the Prophet Mohammad. The suspects, brothers Cherif and Said Kouachi, said they belonged to the jihadist group al Qaeda in Yemen. They were killed in a standoff with police north of Paris in Friday. Charlie Hebdo is expected to publish a million copies of a special "survivors' issue" Wednesday in 16 languages. But the magazine's return comes as Paris was still struggling to return to normalcy.